Keep fully enjoying what life has to offer. That is the starting point for the design of the Rollz rollators. Be it for a stroll in the park, a visit to a museum, a cruise vacation or a shopping afternoon. Our ergonomic Rollz Motion and Rollz Flex design rollators will bring you further, wherever and whenever you feel like going. Going out and about, leisurely and pleasantly, using our design rollator. Transform this stylish rollator with a flick of the wrist from rollator into a transporter/wheelchair and back again. Have you become fatigued of your stroll? Pull out the backrest, place the footrests and turn the handles 180 degrees. When you are rested, simply use the wheelchair as a rollator again. Walk upright, comfortable and steady with the compact and safe Rollz Motion. Is it possible to travel with a rollator? Certainly, Rollz users enjoy vacationing. Thanks to their rollator and wheelchair in one, they can look forward to traveling again! We focused on this at the Holiday Fair in The Netherlands from 10 to 14 January. Many interested people came to gather information. Photos of Rollz users on holiday show that you can enjoy your holiday with a rollator just as well. Shopping is a fun outing again with the Rollz Flex. This foldable rollator gives you support, and all your purchases fit into it. Because of the unique design it is a good looking rollator that you like to be seen with. The shopping bag is more than big enough for your daily groceries. Thanks to the clever design, the rollator remains very maneuverable, even though heavily loaded. This safe shopping companion gives you freedom of movement again. Who are the people using a Rollz Motion or Rollz Flex, what are their experiences? We collected some inspiring stories for you: “Now I can move and walk again, I love that. And everywhere I go, I hear, oh, what a beautiful rollator!”. A rollator should offer proper support and stability. It has to look elegant, modern and stylish. It needs to manoeuvre easily; the better it moves around, the lighter a rollator feels to handle. A robust design with a have a high-end look which will last a long time. Weight should remain relatively light. All of the above successfully merged into the design of the Rollz Motion and Rollz Flex design rollators. The Rollz Motion has won leading prizes: the Red Dot Design Award and the iF Design Award 2012. Choose a Rollz design rollator: choose to enjoy your outings again. Rollz rollators are available in many stores and online web shops in the United Kingdom, in the United States of America, in Canada, in New Zealand and Australia. Here you can see, try and buy the Rollz Design Rollators. Use the button below to find the Rollz distributor in your country. Please contact this distributor for the options. Looking for a lightweight rollator that is collapsible and easy to fold? And which is good looking and sturdy at the same time? The Rollz Flex weighs just 7.4 kg and is designed in such a way that you can take many groceries safely with you. The Rollz Motion is stable, lightweight, and easy to fold, and can also be converted into a wheelchair in no time. Each of these rollators fit easily in the trunk of your car. 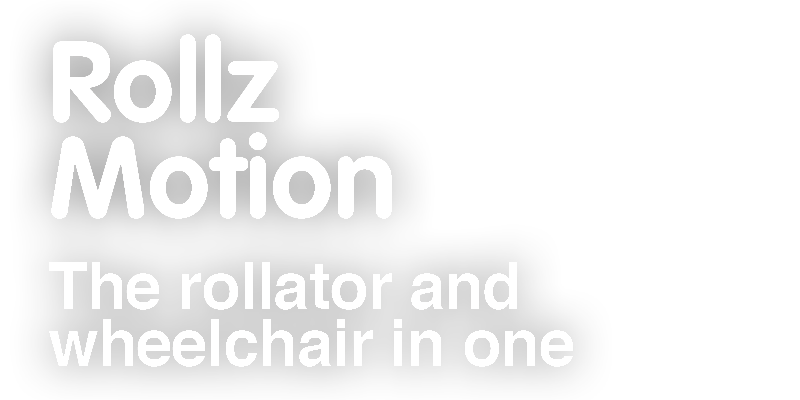 You can rely on your Rollz rollator, it is a user-friendly, versatile tool. With our collection of accessories you complete your rollator with extra’s for your daily use. Do you also use a cane and do you want to take it along on your Rollz Motion? Looking for a bag that fits your rollator to store your belongings? Taking a drink along on the go? If you fly regularly, the travel cover is a necessary addition to protect your rollator during the flight. For the Rollz Flex a stick holder and a set of shopping hooks are available. Are you looking for a foldable rollator that is easy to fold and carry? And besides also good looking and stable? The Rollz Motion can be folded into a very compact package. It can still be rolled forward in folded position, which is convenient if you want to store it away somewhere. It certainly fits in the trunk of your car. Or behind the front seat if you find that more comfortable. You can also compactly fold the Rollz Flex rollator. Have you done your shopping and would you like to put everything into the car? Then you can first take out the inner bag with all your purchases. Then you fold up the rollator. That way it fits easily into the trunk.